Start off your visit on the 15th (Sat): make a trip to Pazhavangadi Ganapathy Temple and then admire the landmark architecture of Sree Padmanabhaswamy Temple. Keep things going the next day: get in on the family fun at Magic Planet Theme Park. You can plan Thiruvananthapuram (Trivandrum) trip in no time by asking Inspirock to help create your itinerary. Varanasi to Thiruvananthapuram (Trivandrum) is an approximately 6-hour flight. You can also drive; or do a combination of train and bus. Traveling from Varanasi in June, things will get little chillier in Thiruvananthapuram (Trivandrum): highs are around 36°C and lows about 29°C. Wrap up your sightseeing on the 17th (Mon) to allow time to drive to Kovalam. On the 18th (Tue), kick back and relax at Adimalathura Beach, kick back and relax at Lighthouse Beach, and then stroll through Kovalam Beach. For maps, reviews, ratings, and other tourist information, read Kovalam trip maker . 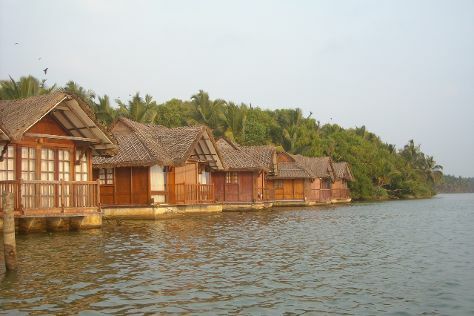 Kovalam is very close to Thiruvananthapuram (Trivandrum). In June, daily temperatures in Kovalam can reach 36°C, while at night they dip to 29°C. 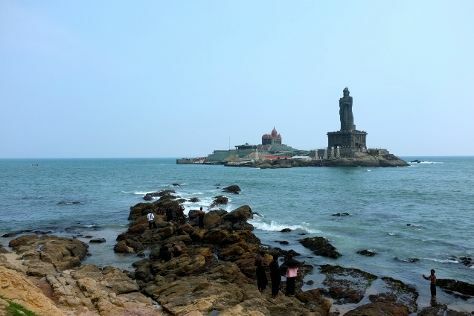 Wrap up your sightseeing on the 18th (Tue) to allow time to drive to Kanyakumari. On the 19th (Wed), contemplate in the serene atmosphere at Bhagavathy Amman Temple, appreciate the history behind Thiruvalluvar Statue, then make a trip to Vivekananda Rock Memorial, then enjoy the sand and surf at Kanyakumari Beach, and finally see the interesting displays at Kanyakumari Wax Museum. To see ratings, more things to do, traveler tips, and more tourist information, go to the Kanyakumari trip planner . You can drive from Kovalam to Kanyakumari in 1.5 hours. Alternatively, you can take a train. Expect a daytime high around 36°C in June, and nighttime lows around 29°C. 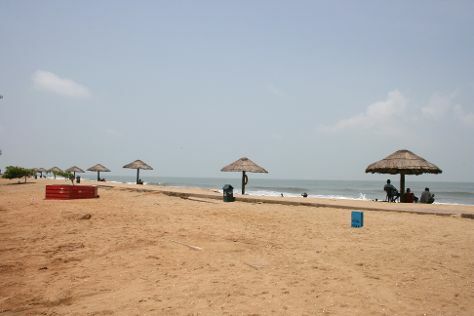 Cap off your sightseeing on the 19th (Wed) early enough to go by car to Alappuzha. On the 20th (Thu), explore the world behind art at Revi Karunakaran Museum, stroll through Alappuzha Beach, and then enjoy the sand and surf at Marari Beach. On the next day, add some adventure to your tour with a kayaking and canoeing tour, take in the spiritual surroundings of Sree Subramanya Swami Temple, and then take in the spiritual surroundings of Mannarasala Sree Nagaraja Temple. For photos, ratings, reviews, and tourist information, read Alappuzha journey builder website . Getting from Kanyakumari to Alappuzha by car takes about 4 hours. Other options: take a bus; or take a train. In June, daily temperatures in Alappuzha can reach 36°C, while at night they dip to 28°C. Finish your sightseeing early on the 21st (Fri) to allow enough time to travel to Pallivasal. Pallivasal is a village in Idukki district in the Indian state of Kerala. Kick off your visit on the 22nd (Sat): take your sightseeing to a higher altitude at Ottakathala Medu Mountain Range, see the interesting displays at Tea Museum, and then take in nature's colorful creations at Tea Gardens. To find photos and other tourist information, use the Pallivasal trip planner . Traveling by car from Alappuzha to Pallivasal takes 5 hours. Finish your sightseeing early on the 22nd (Sat) to allow enough time to travel to Kochi (Cochin). Start off your visit on the 23rd (Sun): admire the striking features of Santa Cruz Cathedral Basilica, then don't miss a visit to Chinese Fishing Nets, then tour the pleasant surroundings at Cherai Beach, and finally take in the spiritual surroundings of Shiva Temple Ernakulam	. Get ready for a full day of sightseeing on the 24th (Mon): find something for the whole family at Wonderla Amusement Park. For traveler tips, maps, where to stay, and more tourist information, read Kochi (Cochin) trip itinerary planner. You can drive from Pallivasal to Kochi (Cochin) in 4 hours. In June, daily temperatures in Kochi (Cochin) can reach 36°C, while at night they dip to 28°C. Finish your sightseeing early on the 24th (Mon) so you can travel back home.